King Kong is coming to Tunisia. 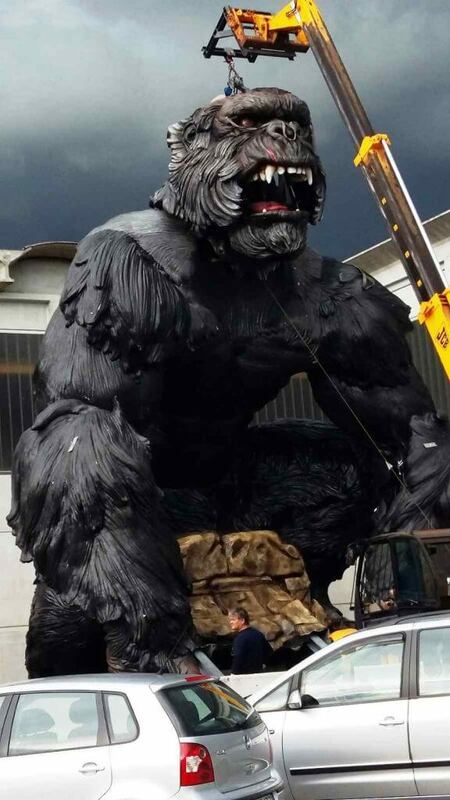 EOS Rides, an Italian designer of theme park rides and attractions, is in the final stages of building a 42-foot tall animatronic King Kong for Carthageland in Hammamet, Tunisia. The giant ape will be the centerpiece of a new spinning coaster, also designed by EOS. King Kong has been painstakingly designed to move like a real gorilla. Specialists at EOS based Kong’s movements on studies of animals and their behavior. For much of the ride, Kong rests on his knuckles and watches park guests, moving his head from side to side. Suddenly, he raises up to his full height, angrily thumping his chest and letting out an enormous roar. Using technique’s from blockbuster movies, EOS has made it possible for real flames to shoot out of King Kong’s nostrils as the coaster speeds by him. His roar can be heard almost a mile away thanks to a 7,200 watt audio system. Of course, Universal Studios also has its own King Kong attractions with Skull Island: Reign of Kong at Universal Orlando and King Kong 360-3D at Universal Hollywood. The 3-D version of Kong at Universal stands at 30 feet tall, compared to the 42-foot version coming to Carthageland. To see King Kong in action at Universal Orlando, take a look inside Skull Island: Reign of Kong in the video below. It’s not clear exactly when the new coaster will be opening in Tunisia, but if you’re a fan of thrill rides this is definitely one to add to your list of must-see adventures.